We often make the mistake of identifying religious vitality with assent to particular beliefs. In this process, we forget that intellectual assent to beliefs is merely one element of religious experience. I was reminded of this fact recently when I observed the Procession of Santa Ana in Antigua, Guatemala. 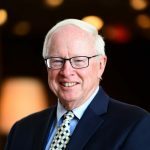 The following day, at a meeting of the John Templeton Foundation, I attended a fascinating session on “aesthetic cognitivism,” which pondered the question of how aesthetic experience relates to the human spiritual quest. 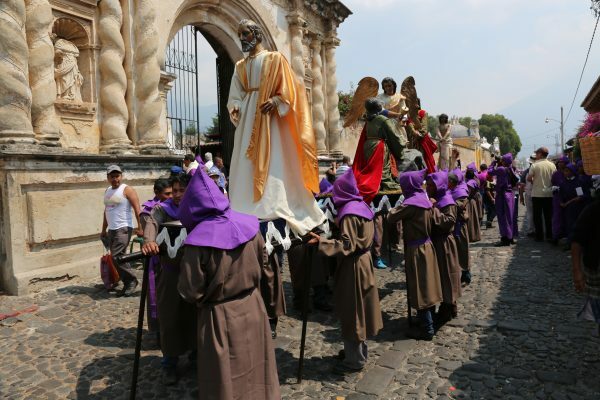 The streets of Antigua were filled with thousands of pilgrims in purple robes, marking the Lenten season before Easter. Interspersed throughout the procession were individuals carrying heavy platforms on their shoulders with life-size images: Jesus in chains before he was judged by Pontius Pilate; Jesus struggling under the burden of carrying the cross on which he would be crucified. Mary, the mother of Jesus, was carried exclusively by a group of 30 or so women. Spread on the cobblestone streets were flowers placed by children. The air was filled with incense that was burning in brass containers swung by teenage boys as they marched in the procession. Intermittently, there were bands playing somber tunes. And along the procession route were hundreds of observers, including both indigenous women in their brightly colored clothing and people with cell phones and video cameras documenting the procession. This was one of many such events that occur during the Lenten season in the streets of Antigua before Easter morning. This procession became a focal point in my thinking about the meaning of aesthetic cognitivism the following day—during a session that I nicknamed “Smells, Bells and Icons.” Religion is an embodied experience that involves all of the sense receptors—touch, hearing, taste, sight and smell. Rituals that engage the senses and emotions aren’t separate from belief. In a complex way, beliefs are embedded within these sensate acts of worship. For example, the architecture of worship spaces can play a substantial role in describing religious cosmology and in marking the transition from the realm of the profane to the sacred. Various physical sensations, such as the smell of incense, connect us to a long string of memories of prior experiences, many of which may be inchoate, but nevertheless form the context for experiences of the sacred in the present. The periods of silence that punctuate rituals involving chants, bells and chimes provide interstices within intense sensate experiences where words find resonance with the Holy—potentially opening one to the depth of human and transcendent meaning. Even the noisy spontaneity of Pentecostalism and the deep silence of Quaker services have ritual logics, although they may not be elaborated with the same structure and formality as, say, the Catholic Mass or Anglican Eucharist. The Christian tradition is not the only location for examining aesthetic cognitivism. Buddhist temples, Hindu shrines, daily prayer for Muslims—all of these have a kinesthetic and aesthetic dimension. Kneeling in prayer, touching one’s forehead to the ground and sitting in silence all act as the carriers of beliefs. Theological propositions that rely on the intellect would not endure without the package of sensate experiences that embed them as memory traces within the human brain. While anthropologists have always known that religion is a whole-bodied experience, sociologists, political scientists and economists too often focus on beliefs, because they are more easily measured through survey questions. But beliefs are not the heart of religion. Why? Because religion is a matter of the heart more than the head. For thousands of years, the human species did not read. And only recently have non-elites been literate. During all of this time, the essence of religion was transmitted through images, music and ritual events. It is a strangely modern idea that human meaning should be reduced to words that are bereft of aesthetic content. Our current hunger for human meaning is arguably related to the fact that we “moderns” think that the depth dimension of life can be captured in words—in self-help books, political slogans or repackaged theological propositions. Perhaps, though, we are beginning to see a shift in this trend. In “reimagined communities” in Los Angeles and elsewhere, innovators are tapping into this ancient aesthetic approach to religion, finding resonance in and prioritizing somatic or bodily experiences over intellectual concepts. Mindful meditation is one way that individuals are seeking to find greater depth in their lives through embodied spiritual practice. The movement—which still is very small—of people turning from mega-church entertainment to more intimate forms of worship and community is another signal of people pursuing a multi-dimensional experience of the Holy. And even in the realm of moral education, there is a growing awareness that the virtues are best taught through richly textured parables and stories, not abstract propositions about right, wrong and moral duty. So let’s bring the aesthetic dimension back into our understanding of religion and the ways that we analyze and interpret it. Beauty, as well as emotions like wonder and awe, are difficult to quantify. But they are the real drivers of religious movements, both ancient and new.